The rugged housing of MT6550 Pro is sealed to IP65 standards for protection against dust and water and withstands 1.2m drops to concrete. The MT6550 Pro provides a full-shift battery life of up to 10 hours. When equipped with Newland’s fifth-generation technology 2D Mega-Pixel engine, the new MT6550 Pro can decode even poorer quality barcodes, such as soiled or wrinkled labels, with ease. 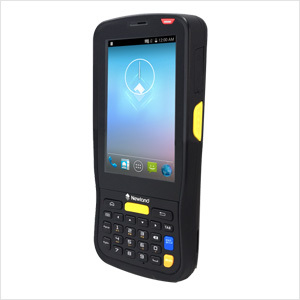 The value-added features of the MT6550 Pro, including application protection and admin tool, seek to shore up Android’s data security. The MT6550 Pro offers Bluetooth/ dual band WiFi 2.4GHz and 5GHz / 4G/ 3G/ GPS/ GPRS/ Camera functionalities to meet various application needs. For your convenience, the MT6550 Pro can be used with a pistol grip and a charging cradle. PDF417, QR Code, Data Matrix, Aztec,etc.